Let’s think about being a little girl, a little child and being old and growing down to the earth. 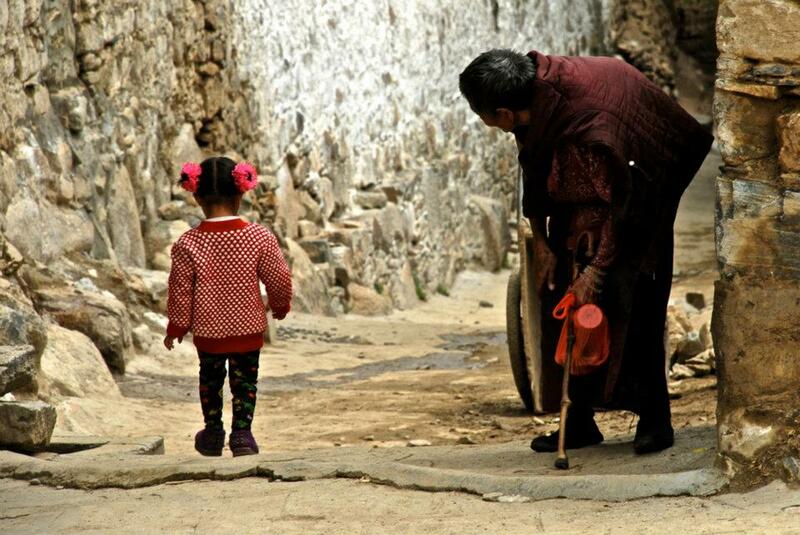 These two people, the smart little girl and the old (bowed?) woman represent relationship in so far as the child is aware of the people around her but does not have to be always engaged with these people. The child goes out to his own future and …………follows the way to whatever place she will go to or the way will lead to. The old woman looks to the girl (after the girl?) and is connected by being there, by looking at the girl and as I imagine remembers herself as a girl. And yet she’s not connected in a here and now- manner. So that one could get the impression both will do something together. They are there, they are connected, but you have to look at those two to realize the connection. Insofar I as an observer of this photo am connected to those two people. And being connected makes the two be more connected than shown on the photo. So, what is the message of the bodily expression of the two people? It is also the impression which I get, which I feel, which I regard as symbolized on the photo and this can happen by being and feeling connected and related to the people on the photo.